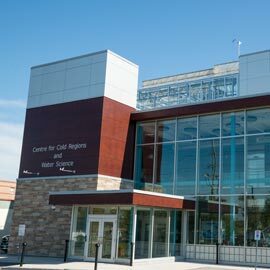 WATERLOO – James McLaughlin, forest soils research scientist from the Ontario Ministry of Natural Resources, will join Wilfrid Laurier University’s Cold Regions Research Centre for an extended collaboration as visiting research fellow beginning in fall 2016. McLaughlin will work with Laurier researchers and students as part of the Cold Regions Research Centre to develop new research collaborations focused on Ontario's far North. McLaughlin will continue his work investigating how human activities and natural disturbance affect soil nutrient and water cycles, water quality and productivity. Specifically, the collaboration will focus on carbon cycling in peatlands and the permafrost of Canada’s far North. The Cold Regions Research Centre Visiting Fellowship was established in 2016 to provide specific support for a member of the wider research community to engage deeply with the work of the centre around a particular topic of interest in cold regions. The fellowship will allow visiting scientists, government, industry, non-governmental organizations and community members to participate in the work of the centre. McLaughlin presented a talk at Laurier entitled, “Climate Change and Peatland Research: Integration with Far North Land Use Planning” in April 2016. In his role as a forest soils research scientist with the Ontario Ministry of Natural Resources Forestry Research Institute (MNRF), McLaughlin is based in Sault Ste. Marie, Ontario. His research program is designed to provide knowledge about soil and water resources to support corporate policies such as the Far North Act, Crown Forest Sustainability Act and Ontario's Climate Change Strategy. McLaughlin has published over 30 articles in peer-reviewed literature and is a member of a variety of professional societies. He is a popular speaker and participant in land-use planning workshops. McLaughlin received his PhD in Forest Science from Michigan Technological University in 1992 and has been a research scientist with the MNRF since 2000.